Be sure to check our Club Calendar for a list of star party dates and other events! 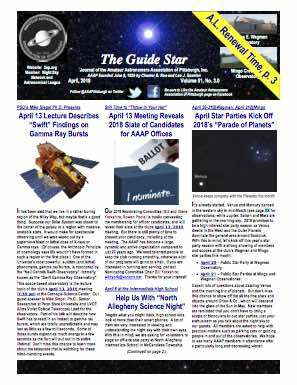 For downloadable copies of Star Party Schedules, go to our Downloads page. Take a whole bunch of friendly, intelligent, telescope-toting amateur astronomers; anxious to share their hobby, put them in a large open meadow at the top of a gentle hill with excellent views to all horizons, add two large permanent telescopes, and invite the public. Many visitors bring their own telescopes to get help with “setting up” or operation. Many bring binoculars, and many just use their own eyes. There is always a telescope with a wonderful view of some celestial treasure just waiting for a novice eye to enjoy. The AAAP members are happy to answer questions about astronomy, buying a telescope, or protecting our dark sky resource (actually you may have a hard time getting some of the members to quit talking once you get them started). Several times throughout the evening an AAAP member will give a “guided tour” of the sky – an introduction to the constellations and brighter stars. The two large permanent telescopes at each observatory are open as well with an AAAP member at each to answer questions, adjust the telescope, and keep people from toppling off the viewing ladders. There are also displays within the observatory’s “warm-up” room covering a wide variety of subjects of interest to amateur astronomers, and the science of astronomy in general. Star Parties are usually scheduled around the time of the first quarter moon; that way very nice high contrast views of the craters and mountains of the moon can be seen, but the moon still sets early enough that good views of deep sky objects such as nebulae, clusters, and galaxies become available. The positions of the planets vary from month to month, but there is always something interesting to observe. The handicapped are encouraged to attend AAAP Star Parties. Portable telescopes are easily positioned for viewing by anyone. The Brashear Refractor at Wagman Observatory is handicapped-accessible for some observations as well as both telescope rooms at Mingo Observatory. A parking pad outside the front door allows wheelchair vans to land passengers where they can easily roll right into the building. Before starting out be sure and check the sky conditions. If the sky is overcast, or the forecast indicates rain, consider waiting for the next scheduled party (most are Friday/Saturday dual night events). If there are just a few scattered clouds with clear sky between, come on up. You can call the Wagman Observatory at 724-224-2510 or the Mingo Creek Park Observatory at 724-348-6150 to confirm sky conditions. There is no running water at either observatory; comfort facilities consist of a portable toilet. No food or beverages are served, so bring your own coffee to stay warm on those cool autumn nights; and bring chocolate chip cookies to bribe your way to the head of any lines. We ask that you turn off your headlights when you enter the observatory grounds, and drive to your parking spot using parking lights only. To really appreciate the sights to be seen in the night sky it is best to have one’s eyes completely dark adapted, which can take up to 30 minutes depending on the person. One quick flash from a stray headlight is enough to set the eyes back to “daylight mode” and require another 30 minutes for full dark adaption. Please drive slowly and use caution when parking. There will usually be AAAP volunteers to direct parking; watch out for them. Alcoholic beverages are not permitted since the sites are inside a County park. Smoking is not permitted within or near the observatory buildings. In fact, since any kind of smoke tends to leave a film on optical surfaces, and there are sensitive portable telescopes set up all over the grounds, smoking of cigarettes, cigars, or pipes is strongly discouraged anywhere on the site. Lastly, even though every member can appreciate the tranquility and relaxation of lying on one’s back on a blanket or just the grass to observe the canopy of the heavens, several nearly disastrous close calls between automobiles (no headlights, remember?) and human bodies have constrained the AAAP to enact a “no lying on the ground” rule, except in certain designated areas far from parking. Please observe this new rule so we won’t have to observe the flashing lights of an ambulance. You do not have to bring a telescope or any observing equipment other than your own eyes. Good vision is not essential either, since most telescopes can easily accommodate the most near- or farsighted eyes (however, astigmatism and some other problems may require the viewer to continue wearing corrective lenses for the best views). There are some items that may make the night more enjoyable and comfortable. Even the summer nights can get quite cool after dark, so a sweater, jacket, or light coat is always in order. For the other seasons, blankets, head coverings, gloves, and extra layers of clothing (including socks) are recommended. For comfortable views of the whole sky, for instance for meteor watching or constellation identification, a folding lounge chair is helpful. All AAAP Start Parties are free to the public. We do appreciate any donations to help defray the costs of operating the observatory and fighting to conserve the natural resource that is a Dark Sky. There is no ticket counter or turnstile; if you see an AAAP volunteer approaching your car they just want to get a head count or give you parking directions. Where Are Star Parties Held? Star parties are held at our observatories several times throughout the year: Mingo Creek Park Observatory (in Washington County) and Wagman Observatory (in Allegheny County). Directions to each observatory are on the respective observatory page and on the downloadable schedules (see the top of this page). Star parties may also be held at community parks throughout the region. Please check with the park in your area for possible star parties. 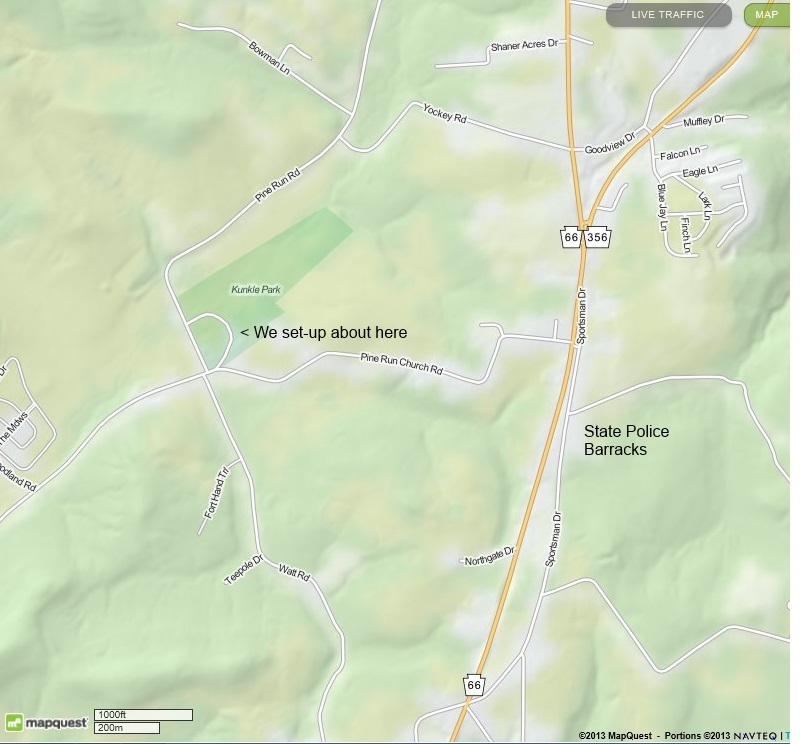 Star parties have been held at Kunkle Park (Westmoreland County) at the location shown below.